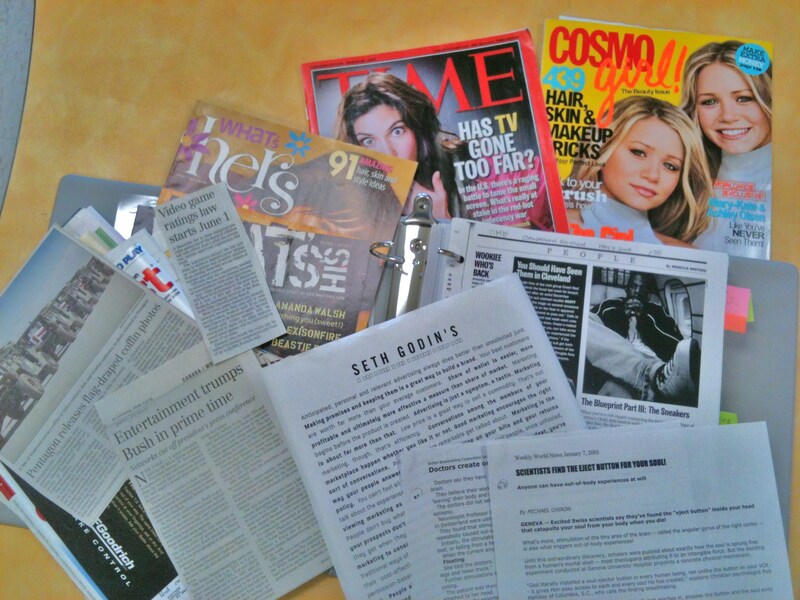 "Media Awareness" was my favourite exploratory course to teach. Lots of interesting content, controversial topics, current marketing strategies, and debate material. Ironically, it is the last of my content binders that I have transitioned to digital archives. As our access to computers increased, availability of televisions and projectors grew, and more content was available online, the binder drifted further and further to the far edge of the shelf (along with my Synonym Finder, replaced by thesaurus.com, the Math Black-line Masters binder, now indexed at R:\Math 8 BlackLine Masters). As an historical artifact, the Media Awareness binder is interesting. First page was Seth Godin's "What Every Good Marketer Knows" and a media clipping about video game ratings laws in Manitoba. A 2005 Time magazine cover article titled, "Has TV Gone Too Far" explored the regulation of decency on American television. Jay-Z's new line of $100 sneakers in 2003 sparked a debate about what we really pay for in designer clothes. We studied Viacom's holdings and viewed Frontline's documentary "The Merchants of Cool". Students dissected advertisements and created their own using the propaganda techniques we discovered from our studies. CTV's documentary about video game addiction led to great debates amongst the students. We even turned our hand at sensationalizing current news after a couple of exuberant classes spent reading the National Enquirer and the Weekly World News. This overflowing binder is rich with content of the past, but ideas relevant today. It boils down to being "Critical Consumers" of media. Know what you're looking at, understand the underlying message, and make a critical choice. Go ahead, buy the $100 shoes, but recognize that $80 of your purchase is paying for advertising. I still do some of this work in the context of the regular school day, but it's time to revisit and re-articulate those core concepts and integrate them more thoughtfully and meaningfully in our day-to-day work. I will purge the binder, and curate some digital resources with my students to meet this need.